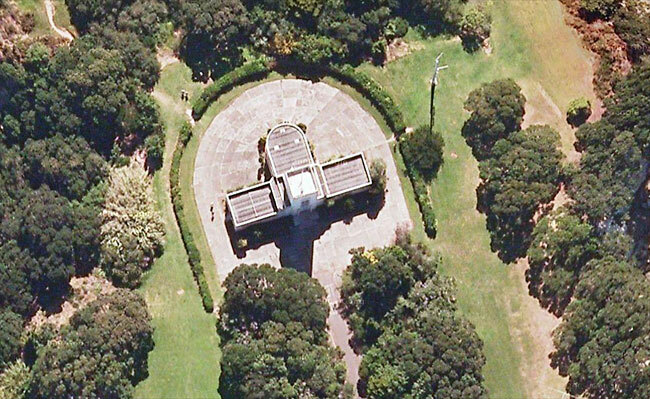 The Musick Memorial Radio station is shaped like an airplane, and approached via a tree-lined driveway. 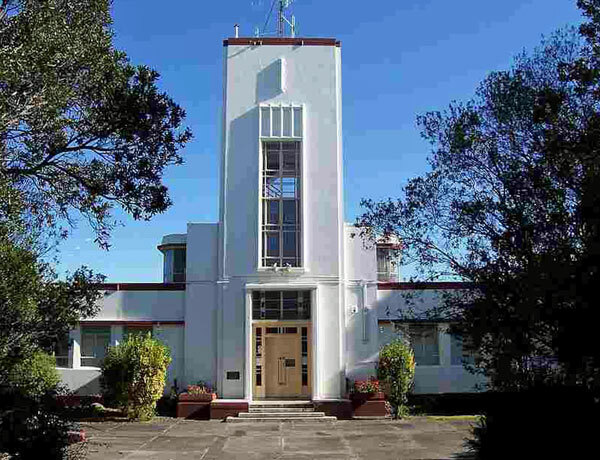 When the Suburban Amateur Radio Group (since renamed the Musick Point Radio Group) lost its place on the Sky Tower due to commercial pressure, our attention was drawn to the vacant ZLD receiving station at Musick Point and we approached the management of Telecom which held the lease on the government-owned building. Approval was given for us to install the 5775 repeater; our presence hopefully offering increased security to the building. The future of the building and site was uncertain at that stage and Telecom were not sure if they would ever use it again, an agreement between the Crown and Telecom being a factor in its future. The 5775 repeater was located in the tower and has been working without fail since that date. Later the Club was looking for a permanent home. Telecom agreed to us using the building as a whole providing the radio club kept it tidy, looked after the immediate grounds and worked in with the groundsman. We eventually entered into a formal agreement with Telecom for a fixed-term lease for a peppercorn rental (this is currently under review). The closure of the transmitting station at Oliver Road had resulted in the storage of all the redundant and written off equipment, records and filing cabinets at the ZLD receiving station. There was one big mess. To open a door into any room at the station was almost all that one could do. The floor was covered in boxes, books, radio racks, radio equipment and junk. It had been stored in a very haphazard way as a result of the transfer of the contents of the transmitting station having to be done in a matter of hours before the transmitter building was bulldozed. Our first job was to have a working bee and tidy up all the rooms. Transmitters of the “possible working type” were stored in one area, and books in another, the redundant useless equipment was disposed of at amateur junk sales (thanks to the local manager at the time) and the club gained a few dollars to cover the cleaning expenses. 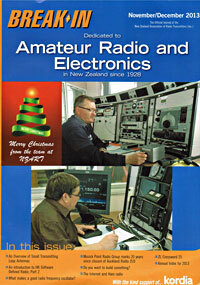 Club members appreciated the help given by amateurs from other Auckland branches in this major effort. The tidy-up took several weeks. Various articles of furniture were relocated and donations of surplus chairs and other items from individuals and other clubs gave the place a friendlier atmosphere. The carpet had to be vacuum washed several times as it carried many years of dirt and dust. Some of the windows could once again be opened after having been painted while shut, and the glass had the tobacco smoke stain removed. A technical check of the bigger transmitters was made to see what could be brought into service without much effort. Receivers were checked out and those that worked were realigned and made to operate like new. The 24V mains generator was found to be using a great deal of mains current and only charging 2 sets of cells. This was switched off to conserve power, and now the batteries are checked monthly to see that the charge is okay for operation if required. The 12V supplies are maintained and can be used on most of the equipment that is running. Due to the noise of the rotary DC to AC converters and the battery chargers in the building, any antennas close in can be affected by the SCR switching, so the first step was to install a remote-receiving antenna near the front gate. This was an old antenna amplifier owned by ZL1BFB and is powered by the station 12V supply. The antenna used was a 1-metre whip. This gave good results to the receivers and several outlets are available. Unfortunately, it didn’t take long for vandals to locate the antenna and remove the whip. Hopefully, it proved a painful exercise, as we found the whip in the bushes nearby, and skid marks on the short pole. The whip was then replaced by a piece of hook-up wire fitted to the standoff insulator. This has also been removed, so a better antenna is required. (Maybe invisible wire). This proved to be a good location as the station QRM is minimal, and vehicle noise from the car park is not noticed. The feed from this antenna goes to the workshop, transmission room, operating desk positions and the supervisor’s table. The club has a 2-metre base set which was donated by a club member (ZL1BBR) and this monitors the repeater at all times, but has crystals fitted for other repeaters and simplex frequencies, should it be required. The memorial foyer, entered from the impressive front doors, is well worth a visit for amateurs and non-believers alike, with its terrazzo flooring and wall plaques commemorating the achievements of Capt Musick and his crew, surmounted by embossed American eagles on the east and west walls.